The future of home design is looking more and more efficient, compact, and customized. While we aren’t quite ready to 3D-print dinner, innovation and invention are at the forefront of building industry trends. Here’s what’s happening on the front lines of home design today based on a tour of the season’s trade shows—and what it means for the house of tomorrow. Looking for similar articles? Search here, keyword HOME TRENDS. ASID is Headed to NeoCon – See You There! ASID will once again partner with NeoCon at The Merchandise Mart in Chicago, June 15-17, 2015. Register today and don’t forget to visit the ASID community lounge at Booth #7-2014. Learn More. Kick off NeoCon in style on Monday, June 15, with a luncheon sponsored by the ASID Illinois Chapter at the Miele Showroon, Suite 222. Spend time with colleagues and friends, and network with ASID national leaders, staff, and ASID members from across the country. End your day with an ASID reception hosted by Allermuir, Suite 3-123. Network with leaders from both organizations, meet designers, and reconnect with friends. On Tuesday morning, Jason Silva, host of the National Geographic Channel series Brain Games, will deliver the keynote address, sure to be one of the can’t miss events of the expo. See the full ASID lineup at NeoCon. Join ASID as we honor the individuals and organizations that are transforming lives through design and celebrate the Society’s 40th anniversary. This year's gala event will take place on Saturday, July 18 at the Museum of Fine Arts, Boston. See art come to life and enjoy drinks and appetizers during the opening red carpet reception. Then move into the museum’s main courtyard for an elegant dinner and awards show. And finally, round off the night with dessert, dancing, and a tour of the art galleries. Ticket prices increase after June 15. Purchase your ticket today. The Nominating Committee of the ASID Foundation's Board of Trustees is now accepting nominations for candidates to fill two open seats for three-year terms beginning October 1, 2015. 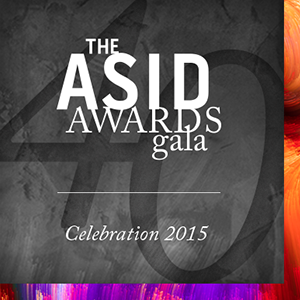 To nominate, please submit the name and a brief bio of the nominee to foundation@asid.org by June 15, 2015. Learn more about the role of an ASID Foundation Trustee. Don't miss your opportunity to network with top firms and designers at the upcoming ASID Student Roadmap program at NeoCon on Tuesday, June 16 from 1:45-4 p.m. Experience a curated tour of NeoCon with professional designers who will help you navigate the trade show. Students will meet with their tour leader and be guided to pick up badges, navigate the Merchandise Mart, and tour showrooms. Register today. Find your next interior design job or learn more about the profession at the ASID Career Exchange on Wednesday, June 17 from 9-10:30 a.m. Students and recent graduates will connect with design professionals and industry representatives for one-on-one networking opportunities. Within 90 minutes, participants engage in multiple ten minute conversations with reviewers to learn about the interior design profession, or to receive a resume/portfolio critique. Reviewers meet with participants to vet emerging talent and to share perspectives on design career path options. Learn more and register. Share your talent and imagination with ASID, and show us how you envision ASID at 40. Enter our #MakeYour40 contest and your creation may be featured at the Chapter Leadership Conference in July. Entries with the most “likes” will be featured. Check out the contest rules and a collection of the 40s we’ve received here. Even if you don’t plan to submit a “40” to the contest, please cast a vote for your favorite. The contest will end on June 15, so be sure to enter and vote today. 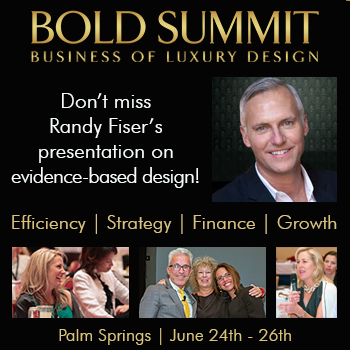 The Business of Luxury Design (BOLD) Summit 2015 will take place in Palm Springs, Calif., June 24-26, 2015. The Summit will focus on increasing profits, building an efficient team, developing a strong referral network, and being recognized in the right publications. ASID CEO Randy Fiser will speak on the research and issues surrounding evidence-based design, including a focus on creating spaces that satisfy a client’s fundamental physical and psychological needs, and the effects of space planning, acoustics, visual elements, and materials. Learn more. Research has shown that many people share certain aesthetic preferences, such as landscape paintings and the color blue. Human biology may help explain why. Call it a baby-boom building boom. Hoping to remain in their homes and communities as they age—but recognizing that living spaces can become unsafe and difficult to navigate—people in their 50s and beyond are retrofitting houses, building additions, and constructing new digs with age-friendly features. A paper delivered at this year’s meeting of the Acoustical Society of America reports that sound may be having a significant negative effect on human health. The researcher shares, “The evidence is increasing that ambient noise levels below hearing damaging intensities are associated with the occurrence of metabolic disorders (type 2 diabetes), high blood pressure (hypertension), coronary heart diseases (including myocardial infarction), and stroke." Scared to Go Fee Based? In order to make the shift to fees for design services, you need a new mindset and way of thinking about what you are offering your clients. This new mindset is NOT becoming someone’s “design slave” for an amount of money that you take a wild guess at when you give a quote. It’s thoughtfully based on assessing what the client is telling you they want, breaking down the necessary tasks, and assigning time frames and money to each part. Branding expert Sarah Walker offers “10 Steps to Creating a Compelling Brand Story.” By “brand story” she refers to what makes the best content, brand strategy, and compelling marketing strategy for a designer. What is "Cost/Value"? "Cost,” simply put, is the number of dollars that you pay for something. If you are not informed about what you are buying, all you will know is the cost. “Value” is the relationship between what you actually spend combined with the quality and durability of what you buy. In design, planning, construction, and shopping, the price tags seem to get all of the attention. Only when we take those numbers, compare them with similar products, and dissect the options, do doors open. The landscape of interior design is rapidly changing due to the immediacy and accessibility of services provided by the Internet. The possibility of becoming a virtual designer, decorator, or stylist is now attainable with companies aiming to provide creative direction solely online. The Co-op: A New Model for Remodeling and Design Firms? Business is booming in the remodeling industry. Profits, not so much. Looking ahead to better days, consumers are undertaking long-delayed home improvements. But their wallets are stuck in the recession. This makes it tough for smaller firms to increase their fees and eke out a bit more profit. What if your firm could stay small but take advantage of a broader reach and economies of scale, like larger firms? Some firms are experimenting with new business models to do just that. The workplace has a tremendous influence on our personal well-being. That’s why experts are rethinking everything about it—how it encourages or inhibits movement, how it helps or hinders collaboration, how it celebrates or suppresses our humanity, and even how the materials we use to build it, decorate it, and furnish it impact our health. In response to rising water bills and ongoing water shortages, particularly in California, appliance manufacturer Whirlpool and plumbing products manufacturer Kohler have announced their commitment to identify ways to achieve net-zero water in the home in connection with ReNEWW House, a retrofitted, net-zero energy, water, and waste research home located near the Purdue University campus in Indiana. When Biomimicry 3.8's Mark Dorfman took the stage at GreenBiz Forum 2015, he wanted to talk about chemicals and how every one of us are surrounded by them. Dorfman pointed out that understanding all of these materials that nature so readily creates could be extremely beneficial in the creation of new and efficient objects. Dunne-Edwards gets a jump on fall design forecasts with the release of its 2016 Home Color and Design Report. The report displays five color and design trends providing insight into what’s trending for 2016. Over the last decade, hardwood floor trends have been influenced by leading designers and flooring manufacturers with custom capabilities. Three current trends in hardwood flooring include: wider boards, textured surfaces, and natural grey toned patinas. Gabrielle Stanley Blair, mother of six, blogger, and author of the new book, Design Mom: How to Live with Kids, believes, yes, a home can be kidproof. “There’s definitely this feeling that ‘I have kids, and the house is going to be ugly and functional...And then when the kids go away, it will be beautiful,’ ” Blair says. "But it’s not necessary to punish yourself like that.” So, how is it done? By being realistic and picking the right furnishings. Interior Design magazine presents its annual preview of the latest and greatest in commercial furnishings on display at this year's NeoCon World’s Trade Fair in Chicago, June 15-17. Until now, the holistic impact of classroom design on learning has been an unknown quantity. Although many people intuitively feel that classroom design is important for effective learning, there has been very little real evidence. After three years, the UK-based HEAD (Holistic Evidence and Design) study has now established the evidence for how important classroom design is for learning, and which of the factors involved are particularly important. You can transform any hotel from every-day to exceptional using a sophisticated color palette. Also think beyond color. Go for texture with opulent fabrics for upholstery and curtains. Many of us fear and avoid public bathrooms due to the germ factor. From the bacteria lurking on door handles to dirty basins to the toilet seat itself, a public bathroom visit can be quite the hygienic challenge. We’re entitled to hygienic doubt, with a few recent reports revealing some alarming stats. Here are four ways design and technology could be implemented in public bathrooms to help combat germs. When tasked with converting a former office space in New York City into CRS, a yoga and meditation studio, Clouds Architecture Office lived up to its name with a foggy brained idea. By gently curving interior walls and tapering the ceilings, the designers recreated the feeling of a fog descending indoors, realizing their basic concept of "transcending reality." Removing hard edges let spatial boundaries fade into the perceived distance.